So often we hear that families in developing countries are subject to workplace violence, indentured servitude, and chemicals which affect them and their families. But there is a better way. When ordering from overseas, choose options which are fair trade. And, when they're environmentally friendly, that's even better to offset the carbon footprint of shipping. Gifts for Kids with Pebble by Kahiniwalla! They're fair trade and available on Amazon. Many are on Amazon prime. Easy to order fair trade! Kahiniwalla is a business which distributes Fair Trade products and tells the story behind those products. They care about the quality of their products, how they’re made with the bigger picture in mind. Pebble is one of these products designed by Samantha Morshed, a social entrepreneur based in Bangladesh. Samantha's vision for Pebble of providing a place close to rural homes in Dhaka where women could work flexible hours was just what over 12,000 rural women were looking for. These rural workplaces provide a welcome alternative to women moving to a large city to work in the garment industry leaving their families behind and making themselves vulnerable to unsafe, unjust and sometimes violent situations. Knowing the Pebble products are ethically made makes them that much more amazing! 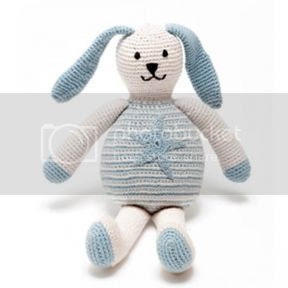 Gifts like the Blue Motif Star Bunny are not only adorable and cuddly, but they are made from 100% organic cotton! This precious bunny face is sure to capture the heart of your child and you will feel good knowing that you contributed to making a better life for the women in rural Bangladesh. Give your child and the women working hard in Bangladesh a beautiful gift this holiday season with Pebble! If you would like to learn more information about Pebble please visit http://kahiniwalla.com or order from the affiliate links above. Get it now 25% off Steve Spanger Science Kits!